"Who Owns Pakistan": Good question! Where do you think you’re going?” challenged the commando at the checkpoint on the road to Mangla Dam in Mirpur. To the Mangla Fort, I replied, resisting the temptation to ask him what the hell he was doing blocking my way. He was heavily armed, and it seemed pointless arguing. “The Mangla Qila has been closed for two years and it’s going to be closed for at least another two years,” he scoffed. That was a shocker for my guidebooks indicated the ancient fort was open to the public. Never take no for an answer in Pakistan. There is always a way out (well, almost). And I don’t mean bribing people with laddoos or Cadbury’s chocolate. “Actually”, I offered in a sweet-as-mango voice, “I’m visiting the Boating Club”. That did it! After checking my ID and confiscating my car steering wheel lock (I did get it back on the way out) because — would you believe — it was considered a dangerous weapon with which I might clobber someone, I was allowed to proceed towards the dam. The army sports and boating club chaps were huffing and puffing by the dam, going through their early morning exercises, but this wasn’t why I had come all this way. One can just about see Mangla Fort from near the boating club but the turn towards it is closed. More security people. No sweet talk here: “Turn back” was the command. You’d think they had the blasted crown jewels at the fort or even some nuclear installation inside it. My hour and a half trip up here from Rawalpindi had been foiled this time. One has to go through the WAPDA office in Mangla for special permission to visit the fort, which, until fairly recently, was a public access site. ‘Security reasons’ now bar the public from one of Pakistan’s heritage sites. However, I have to add that the people at WAPDA were brilliant in their assistance and I was eventually given a complete tour of the old Ghakkar fort. It was the Sikhs in the middle of the 19th century who gave the structure — originally a mud fort — its current form. “Where do you think you’re going?” came the interrogating voice. Until that stage I was leisurely going about Shershah Suri’s famous Rohtas Fort near Jhelum. What is it with these Pakistani commando types (he was in army uniform)? It was near the Maan Singh Haveli inside the fort that I got harassed. This is a tourist site, I fired, and I’m going about my business as a tourist. So buzz off! The soldier then ordered, “No photographs!” A tourist site where one can’t take pictures! I thought Pakistan was trying to promote tourism and especially world-class historic places such as the 16th century Rohtas Fort. General Maan Singh, a governor of Lahore during Emperor Akbar’s time, would have been offended to have idiots harassing travellers and guests near his mansion. One would have been offered a certain degree of hospitality. Not now. What, I argued with the soldier, is the point of people coming all the way to especially visit this place if they can’t take photographs? He mellowed and offered a way out: “Well, no professional photographs”. Whatever “professional” is supposed to mean! I was a mere tourist and I was off on my way again. The Department of Archaeology and Museums has carried out some excellent improvements at Rohtas. These include new signs and paths leading to the various parts of the massive fort. “Where do you think you’re going?” shouted the soldier as I approached the entrance of what was signposted as “Begum ki serai” on the eastern bank of River Indus, near Attock Fort. Oh hell, here we go again, I thought. I was actually looking for Shershah Suri’s caravanserai, I explained. “You can’t come in here, this is an army training site now,” I was informed. But I thought this place was open to the public. It’s an historic site, for goodness sake. And it had taken me two hours to get here. Yes, I had seen the big army notice saying “YALDRAM” but didn’t know what it meant. And before one even gets here one has to get past the checkpoint on the side road leading up here from the GT Road. Oh, they make it so difficult to visit these historic places. After talking to the superior at the site, I was allowed to look around the caravanserai on the condition that I wouldn’t add any “mirch masala” when I wrote up the piece. Now, who would want to do anything like that, spice up a column with naughty bits about soldiers training in the ruins of an ancient place? No, sir, not me! Believe me, I wasn’t doing a Carry On comedy entitled Up the Begum’s Serai or anything like that! According to my guide books, this large courtyard, surrounded by numerous rooms on its sides and a building in the middle, fitted the description of Shershah Suri’s 16th century caravanserai, but the notice at the site attributed it to Emperor Jahangir’s period. Funnily, the sign reads “1605-1627 AM” as if giving a time rather than a date, 1605-1627 AD. The “Begum” is said to be either Emperor Akbar’s or Jehangir’s wife. “Where do you think you’re going?” questioned the plainclothes shalwar kameez-clad man when I got near Sujan Singh’s Haveli in the old quarter of Rawalpindi. Is there no hassle-free way to visit historic sites in Pakistan? Rai Bahadur Sardar Sujan Singh would have been appalled by the behaviour of the so-called custodians of his 19th century mansion, described as “one of the richest and tallest houses in the city” in the pre-Partition era. The building, in terrible, shameful disrepair since Partition, is now in the hands of some intelligence section of the police. And they don’t like tourists or budding historians near the place. There are two historic sites I didn’t even attempt to visit for fear of being locked up. 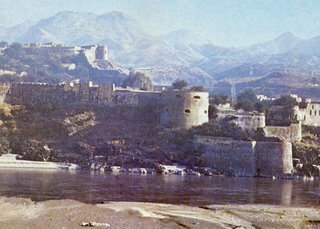 Emperor Akbar’s Attock Fort, up by the River Indus, on the way to Peshawar from Islamabad, is out of bounds as it is under the control of the army. 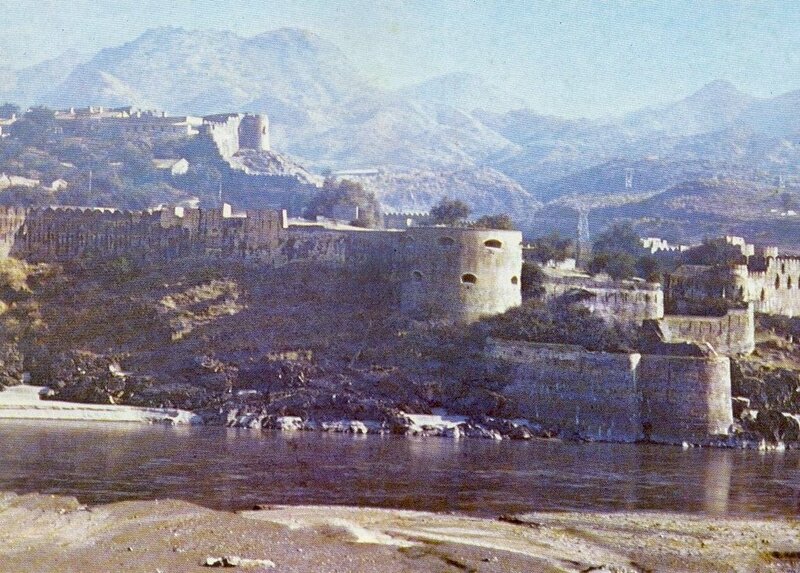 The Sikh Bala Hissar Fort in Peshawar is also under the military control. One can, however, view both from a distance. There are excellent views of Attock Fort as one crosses River Indus on the way to Peshawar and turns left on to the road along the river leading to Nizampur. It is not just while visiting historic sites, and confronting the security/military personnel there, that makes one wonder “Who owns Pakistan?” but everywhere one goes one sees constant reminders.